The decision of Dan Price ’08, CEO of Gravity Payments, to raise his employees’ salary to a $70,000 “minimum wage” spawned headlines and sparked all kinds of reactions across the nation, some of which are detailed in a recent follow-up report in The New York Times. What are the ethics involved in a radical business decision like this? And how might Christians think about fairness and equity? We asked Professor of Business Ethics Kenman Wong, of Seattle Pacific University’s School of Business, Government, and Economics, for his perspective as an ethics expert — and how faith could shape our thinking about worker pay. Response: Are you surprised that the Gravity Payments wage decision has provoked such strong reactions, both positive and negative? Wong: On one level, I’m not surprised. As a country we are deeply divided over the role of the state in addressing income inequality. However, unlike minimum wage laws, Gravity’s new policy doesn’t involve government intervention. So I am a bit taken back that a decision made by a privately held business to reallocate salaries would provoke such negative comments and personal animosity toward Dan Price, especially since he’s voluntarily giving up over $1 million per year in salary. Are there ethical dimensions to a decision about worker pay that the average person might not think to consider? Yes. Wages are more than the product of blind universal laws or some sort of “natural order” at work. The most obvious ethical considerations are fairness and equity with respect to how we are paid in relation to our peers. For Gravity, a major challenge will be paying well while simultaneously rewarding factors such as performance, since greater wage compression will likely result from the higher minimum wage. Ethics also influence pay decisions in more subtle ways. For example, many of us assume that wages are strictly determined by of supply and demand, while, in fact, powerful economic forces reflect cultural values and are not as objective as scientific laws. This is evident in the vast differences between countries in top to bottom pay ratios. Interestingly, some researchers (such as UCLA professor Jody Heymann) have found that companies that pay higher wages at the bottom of their pay scales can financially outperform their peers — though of course we won’t know the outcome of Gravity’s decision for a while. An increasing body of evidence (by researchers such as Duke University’s Dan Ariely) also suggests that our “economic” decisions are driven by a host of influences (including moral ones) as opposed to just “rationality” (self-interest). For example, employees may choose a lower-wage profession or position in order to engage in work they find meaningful. Each of these ethical dimensions add complexity and flexibility to determining compensation. The recent New York Times feature on Gravity Payments compared the “$70,000 minimum wage” to the biblical parable of the vineyard (Matthew 20). Do you think that’s an apt comparison? I am not a qualified scholar of the Bible, so please take my comments accordingly. Although the parable has some parallels to Gravity, its primary purpose seems to be an illustration of the nature of the kingdom of God. Thus, we should be careful not take it as some sort of manual on good pay practices. While I agree with the author’s contention that paying the same wages makes for bad policy, she also misses an important difference — Gravity is not attempting to pay every employee equally. The controversial $70k wage is a gradual minimum. The article’s discussion of the parable also separates heaven and earth too sharply. At SPU, we see ethical business as part of the kingdom of God. Part of what we try to do is shine the light of heaven on our earthly affairs. What would you most want your students to think about if you were discussing Gravity Payments’ situation in the classroom? Gravity’s situation presents a good opportunity to examine the purpose of business as informed by our Christian faith. Is business solely about the creation of economic value via profit or is it also about creating other forms of value/capital? Gravity also gives students a chance to “wrestle to the ground” the practical meaning and implications of what would otherwise be abstract ethical concepts such as generosity, justice, and fairness. I would want students to experience the complexity of business decisions and to count the potential costs of bucking convention and following one’s convictions. As we have seen, Gravity’s decision has already produced some difficult tradeoffs and burdensome costs. An additional aim I would have is for students to recognize the fact that every business is different and that the tension between the ideal and the realistic can sometimes be vast. Contextual factors (profit margins, competitive environment, tradeoffs) may render it impossible for other employers to pay higher wages while honoring competing obligations — although every employer should be as generous and as fair as possible. Do you think there are distinctive ways that Christians might think about wages, fairness, and inequality? How, for you, does faith play a role in these types of decisions? Christians actually have a long tradition of ethical reflection on compensation. Patristic and medieval theologians debated the concept of a “just” or “moral” wage. The overarching narrative and specific passages of the Bible provide us with some broad guidelines that emphasize generosity, justice (rendering what is due, proportionality, and impartiality), and special consideration for those who are poor and marginalized. We are not given specific dollar amounts or ratios. For the faithful employer, I believe pay is a matter of discernment, requiring the guidance of scripture, prayer, wise counsel, and sound reason. For two thought-provoking works on biblical perspectives on pay, I would recommend this article by Tim Weinhold, a member of SPU’s School of Business, Government, and Economics Advisory Board, and the book The Ethics of Executive Pay: a Christian View, by Richard Higginson and David Clough. Some customers left, but the overall retention rose from 91 percent to 95 percent. Customer inquiries shot through the roof, from a normal rate of 30 per month to 2,000 within two weeks. Revenue and profits doubled, and only two employees quit. As the workload increased, Gravity hired additional employees to handle the inquiries, media attention, and job applications. Several Gravity employees claimed the raises made big differences in their lives, and one new client who saved about $800 per month after switching to Gravity decided to give his employees raises instead of pocketing the difference. 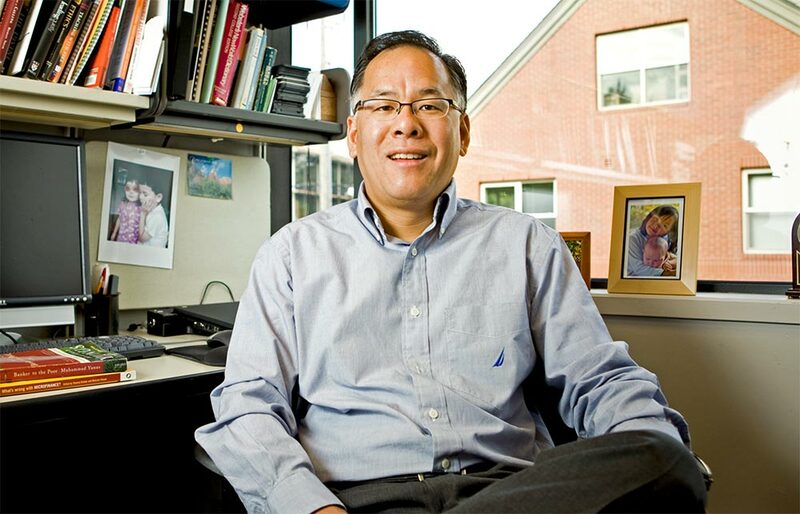 Kenman Wong is professor of business ethics in the School of Business, Government, and Economics at Seattle Pacific University. Co-author of Beyond Integrity: A Judeo-Christian Approach to Business Ethics, and Business for the Common Good, he researches and teaches courses in business ethics and the role of markets and business in global development.